Frederik October 12, 2012 Comment? 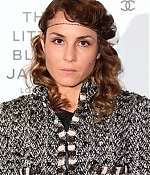 Noomi Rapace was a prerequisite to Chanel’s ‘Little Black Jacket’ event in London, last night. The event was to celebrate the launch of an exhibition of photos of different people wearing Chanel’s iconic ‘Little Black Jacket’, at the Saachi Gallery in London. Pictures can found in the gallery.